For the past several months, we’ve been creating a unique living option called the Lodges at LindenGrove. The Lodges are designed specifically for adults living with advanced physical needs. 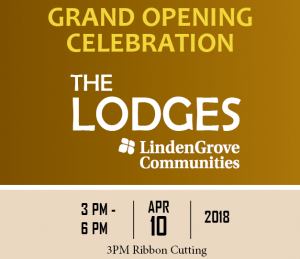 On April 10, we are excited to give everyone a chance to come out to our Waukesha campus to see these charming, one-of-a-kind lodges during a grand opening celebration. 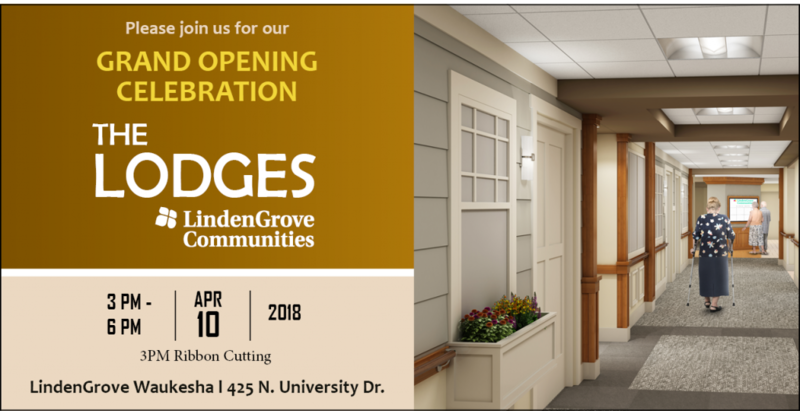 Not only are we celebrating the opening of our advanced assisted living lodges, we’re also showing off the new location of our rehabilitation center that features floor to ceiling windows and we’re giving everyone an opportunity to walk through the connecting corridors we are building to allow for comfortable travel between buildings no matter the weather. As you can see, we have a lot to show you! We’ll kick off the celebration with a ribbon cutting at 3 p.m. There will be tours, hors d’oeuvres, entertainment, a chance to win great prizes and much more. The Lodges at LindenGrove features 20 private lodges with bathroom, a bistro, comfortable common living areas, outdoor patios and beautiful garden areas. We’re calling this level of support advanced assisted living because it is designed especially for individuals who are in need of more support than what an assisted living facility typically provides, but they do not need the 24/7 level of care a nursing home provides. We believe our advanced assisted living could be a great choice for a variety of medical conditions. A few examples include Parkinson’s Disease, congestive heart failure, COPD, diabetes, osteoarthritis or rheumatoid arthritis, among many more. The Lodges will feature a robust staffing model and caregivers will be trained to provide the enhanced support our residents at the Lodges will require. We look forward to seeing you at our grand opening celebration!